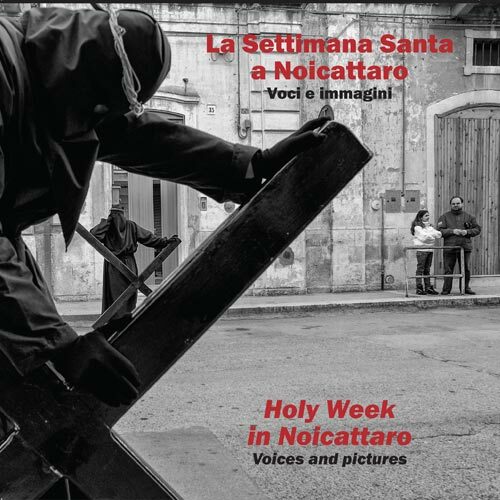 Holy Week is one of the most deeply felt religious events in Apulia, celebrated by small and large towns alike. 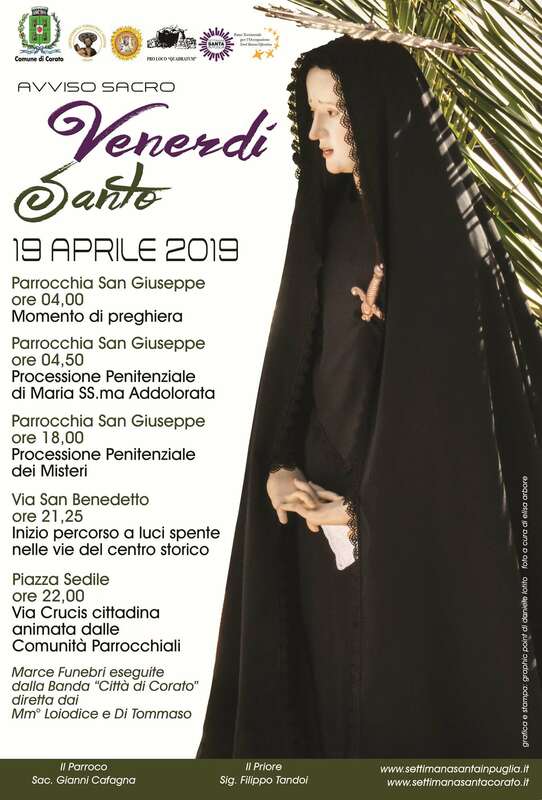 Possibly the apex of the religious calendar, especially as far as concerns external events, Good Friday generally includes a procession representing the Mysteries, as well as a procession celebrating Our Lady of Sorrows, also celebrated on the Friday before Palm Sunday known in Italy as Passion Friday, in almost every town. 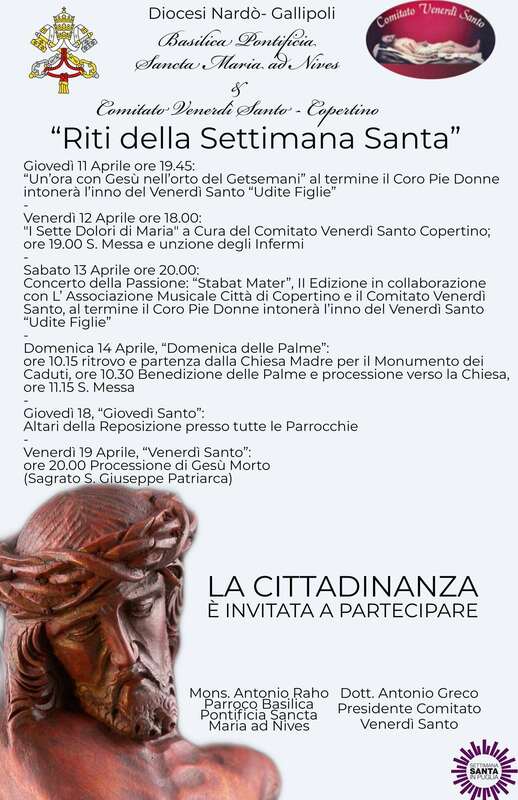 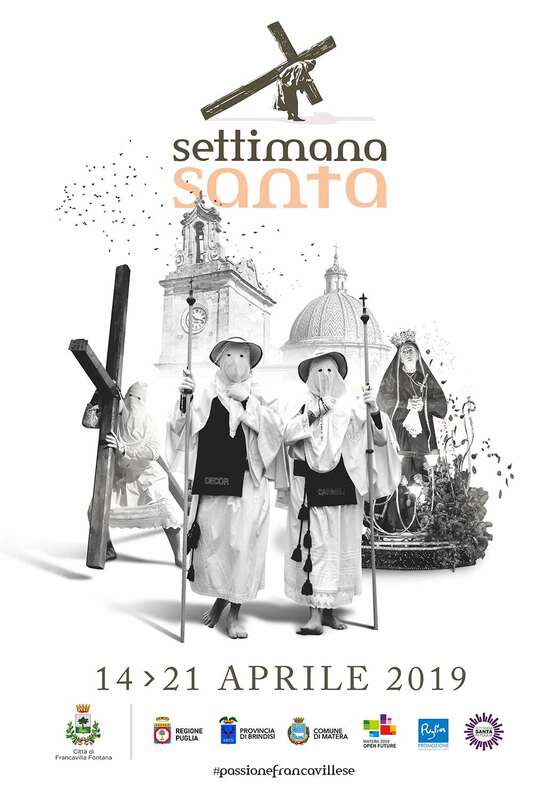 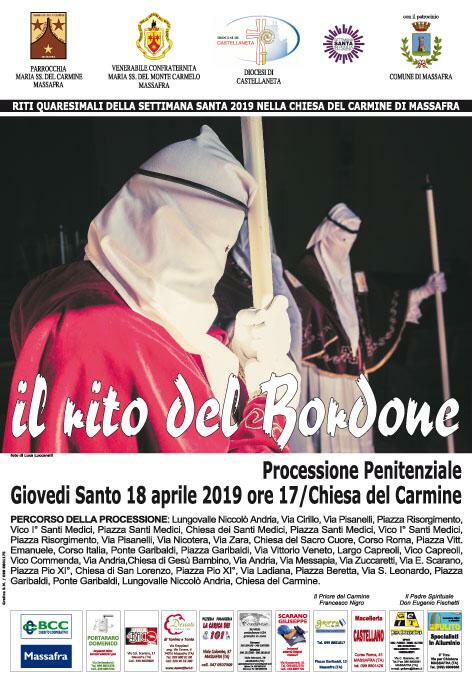 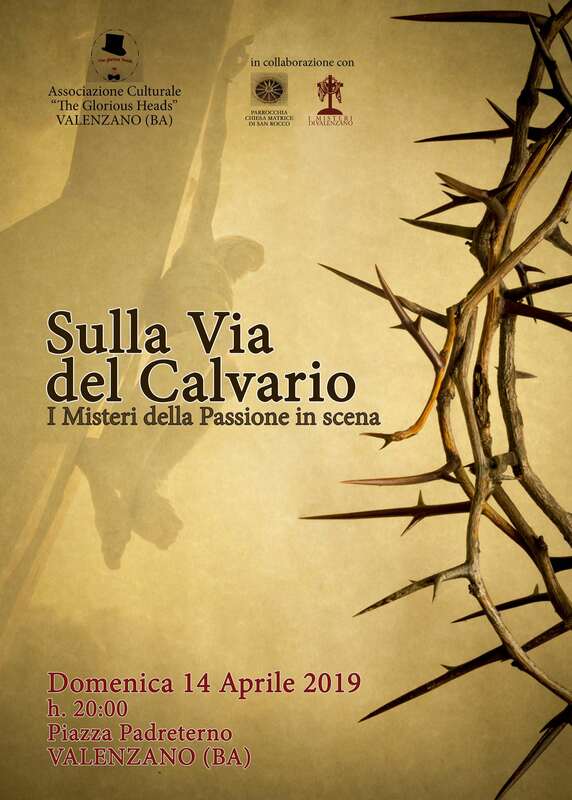 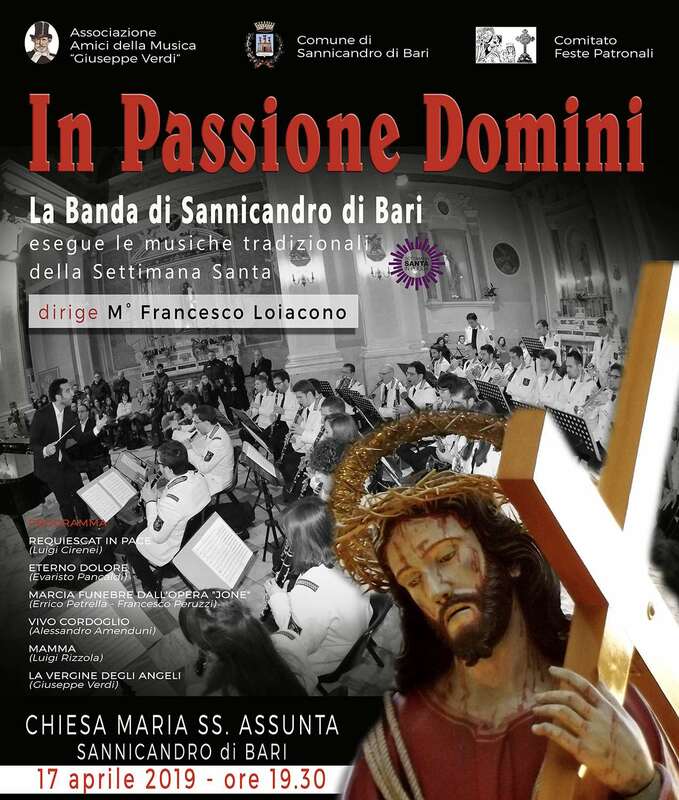 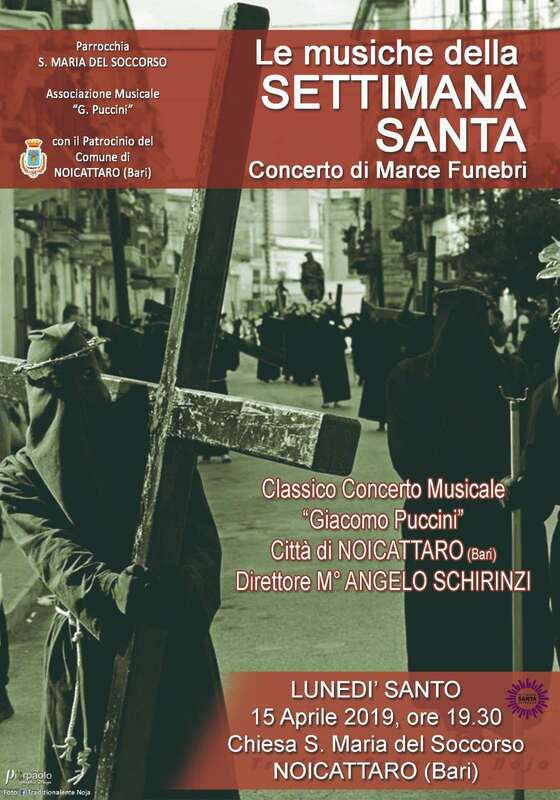 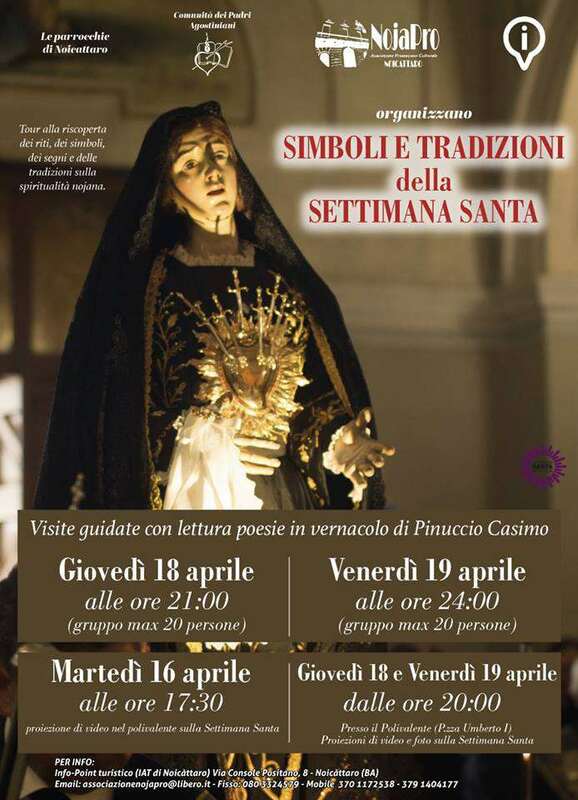 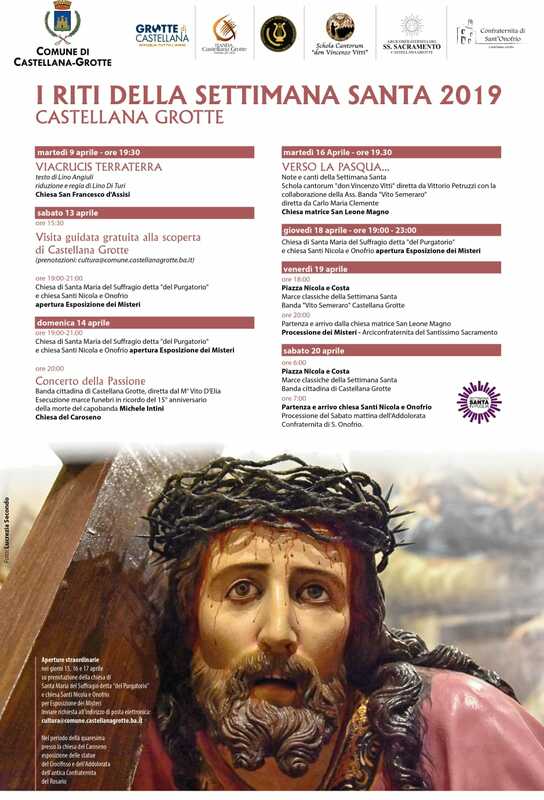 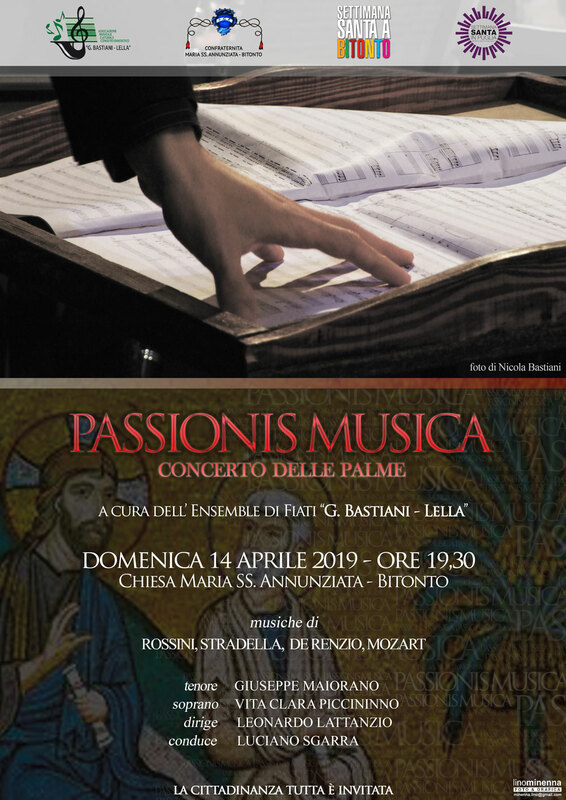 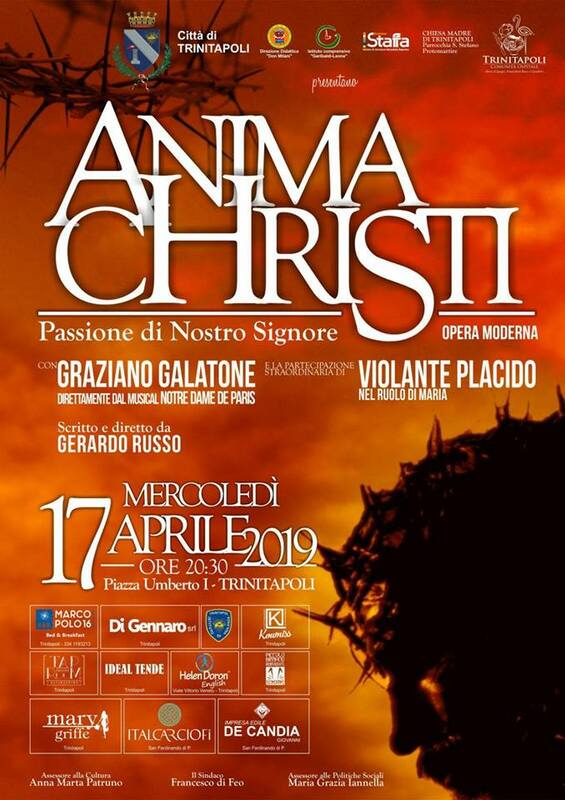 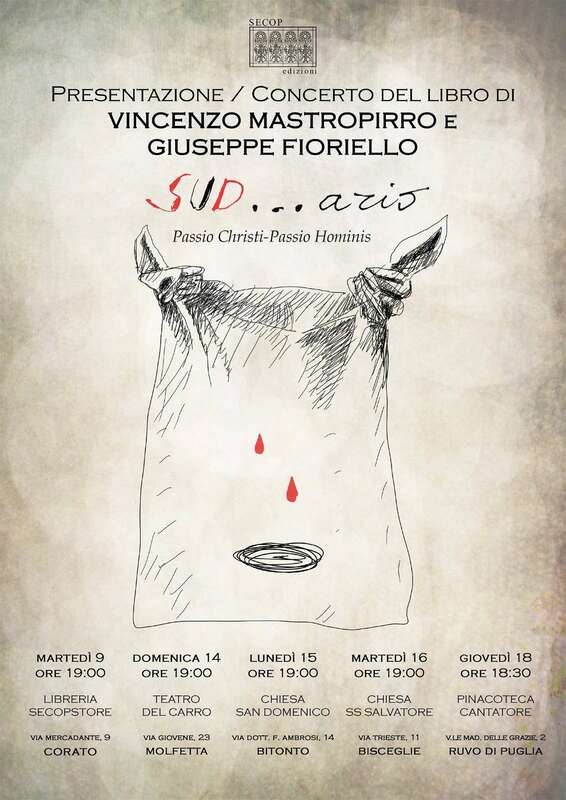 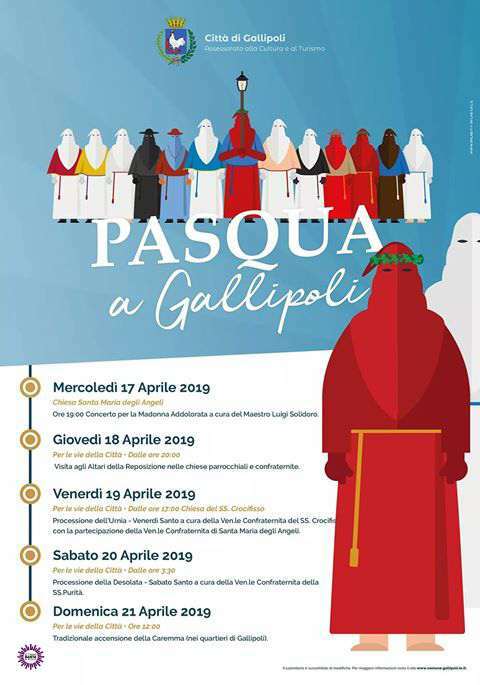 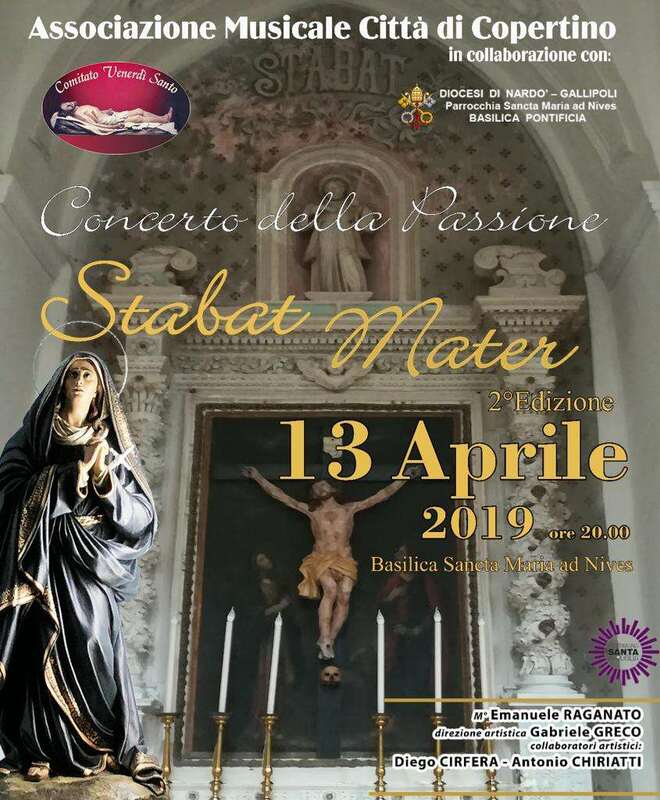 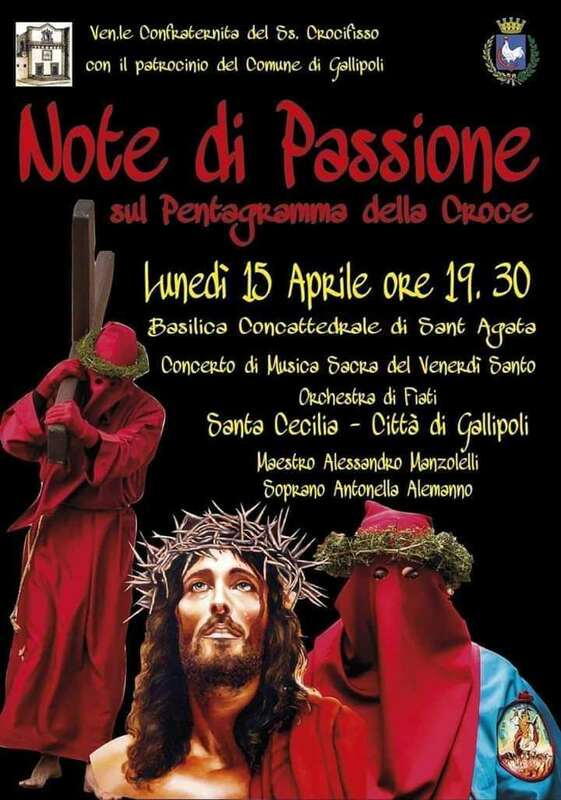 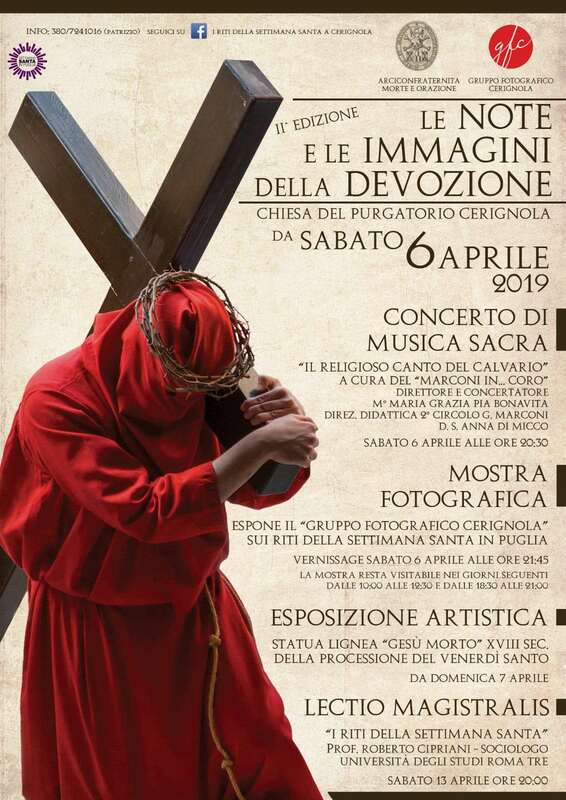 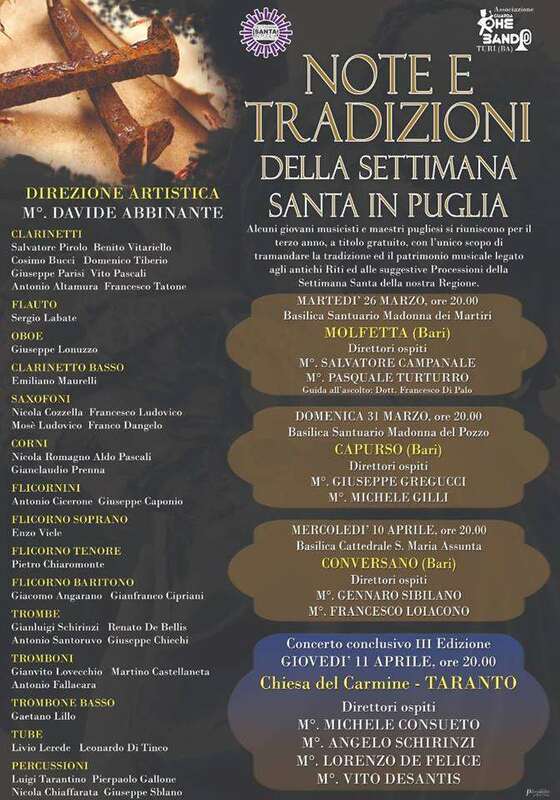 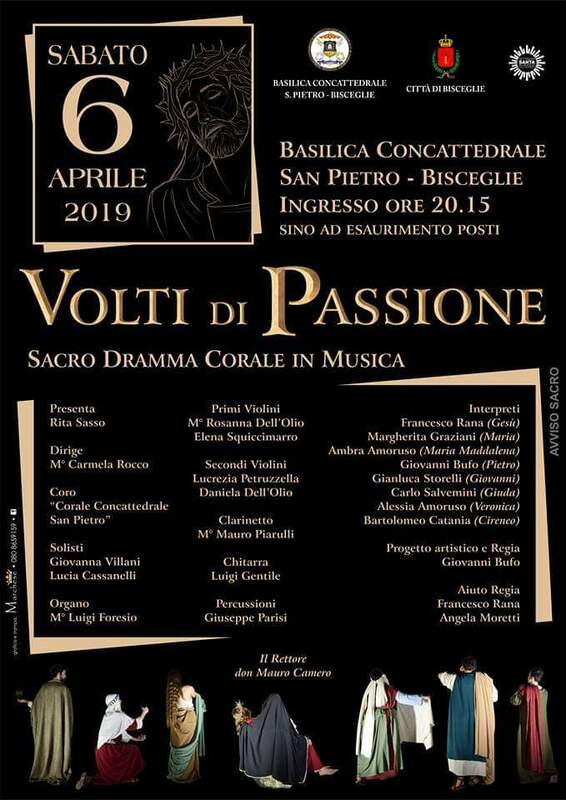 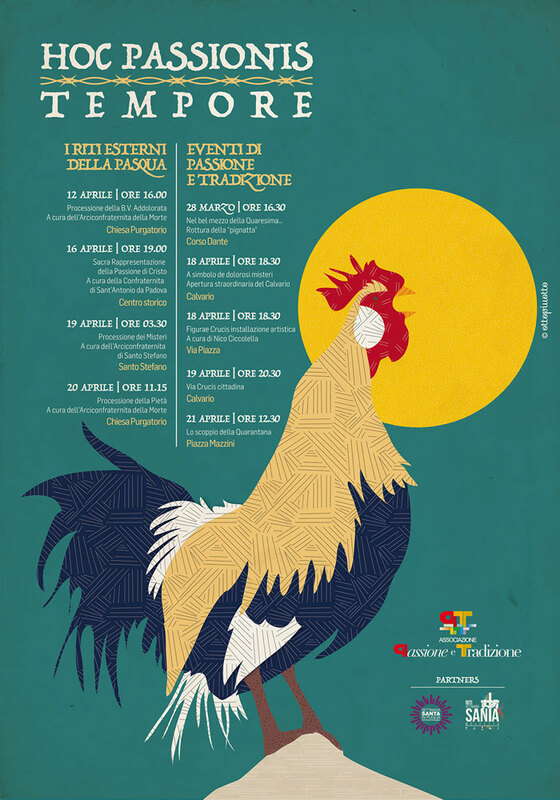 In Apulia Holy Week is markedly notable for the activism of the lay Confraternities, an involvement which includes both participation in the rites and their organisation. 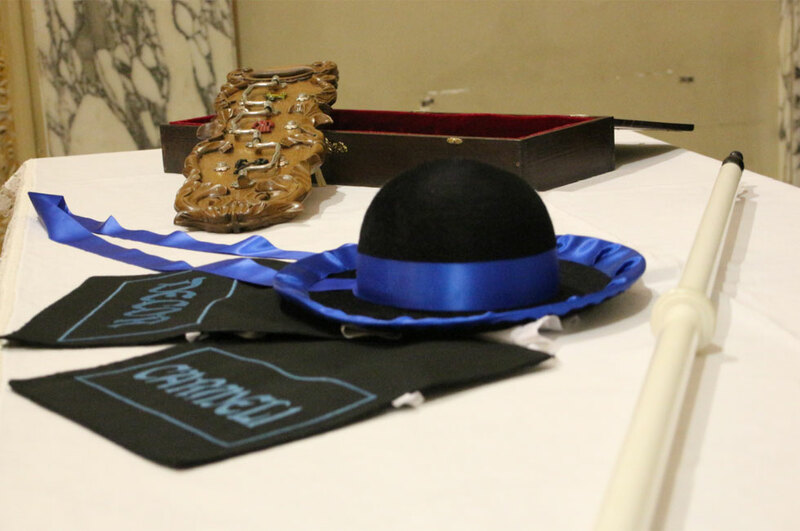 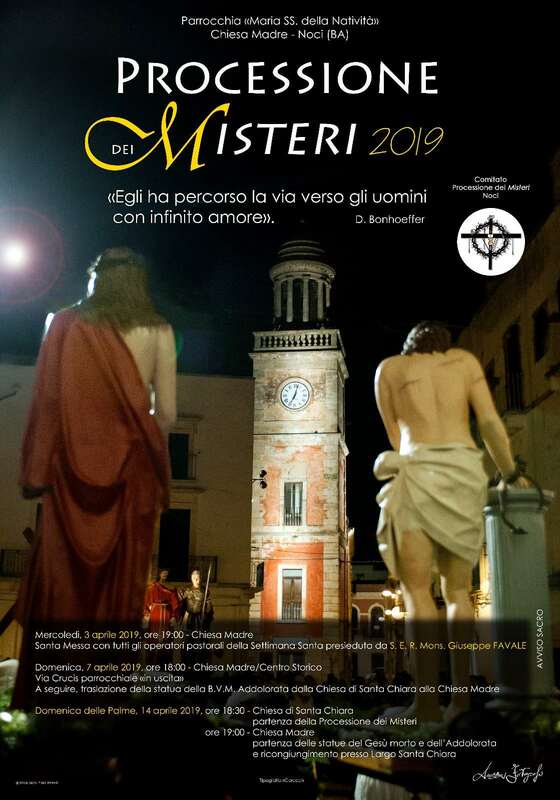 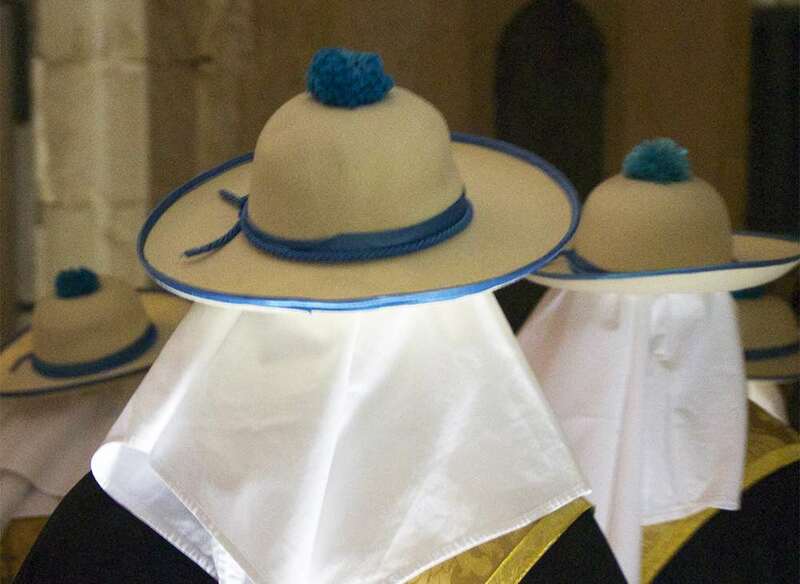 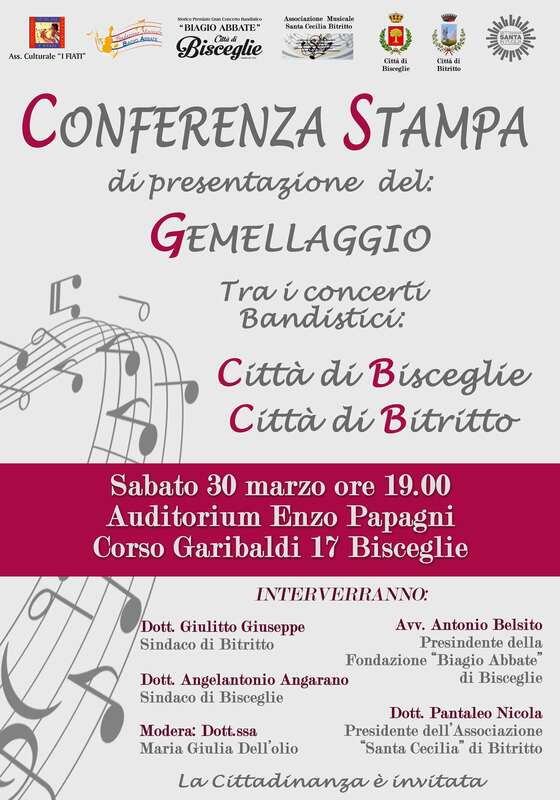 The confraternity movement in Apulia is imposing: the numbers given by the Confederation of Confraternities of the Italian Dioceses for 2012 show the presence of two hundred thousand members of nine hundred and eleven societies. 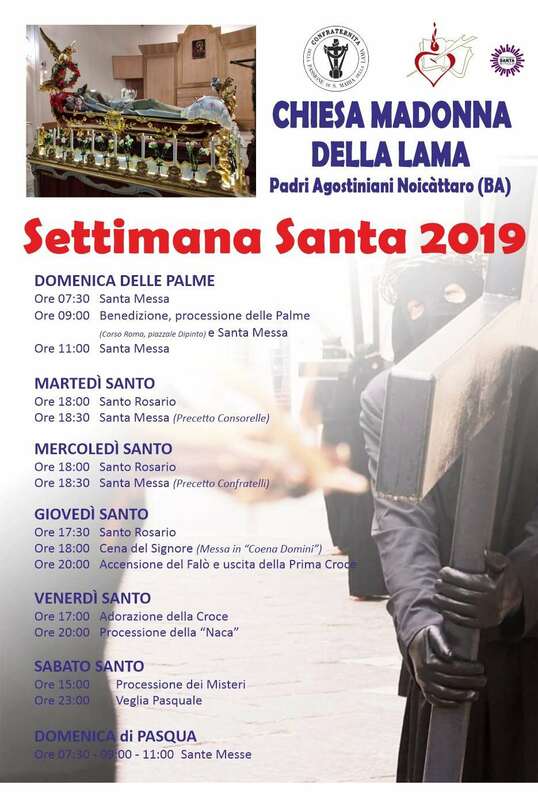 Amongst these there are Confraternities with numerous members, some of which have over a thousand members, such as the Archconfraternity “del Carmine” and the Confraternity “dell’Addolorata” in Taranto or the Archconfraternity “della Morte” in Molfetta, in the province of Bari. 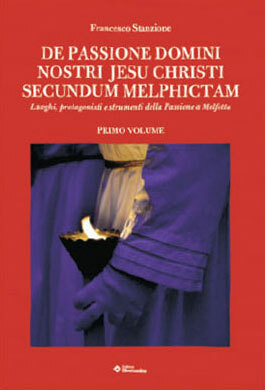 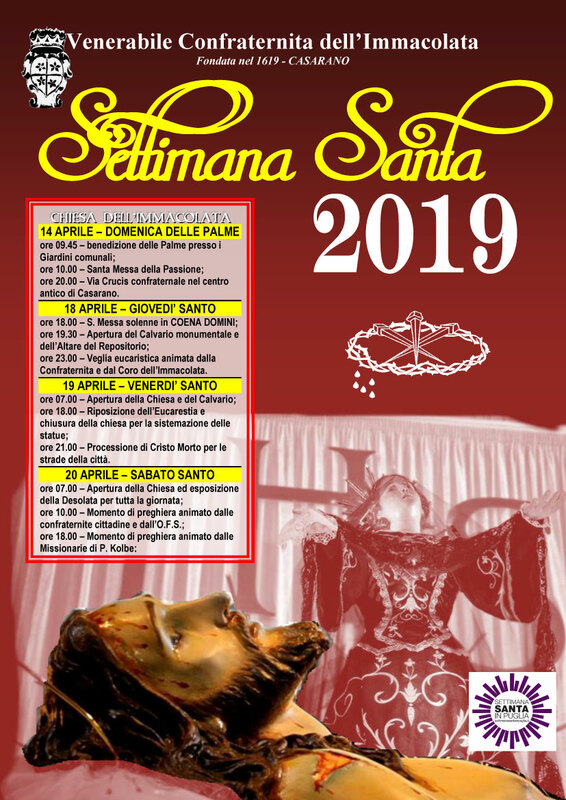 It is almost always the case that the Confraternities with the most members are those connected to Holy Week, it can be said that in some towns there is not a family that does not have someone who is a member of one of the Confraternities; from this it can be easily seen how deeply rooted the traditions of this period of the year are in Apulia and its people. 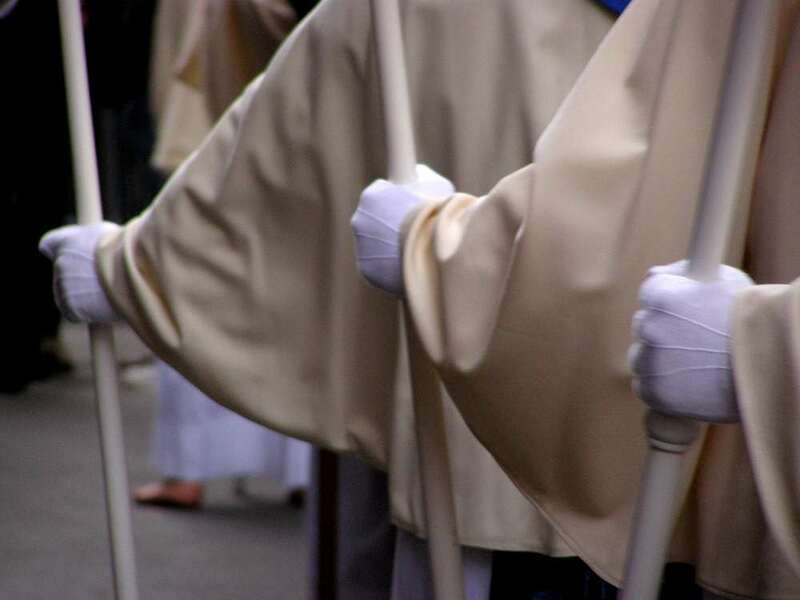 The Confraternities that organise the rites of Holy Week are amongst the oldest. 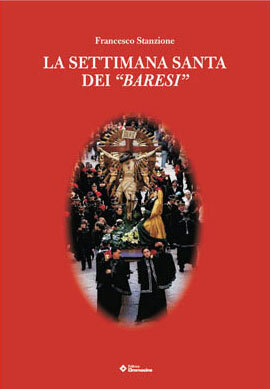 Some were founded as far back as the mid-13th century, well before the counter reform following the Council of Trento which took place between 1545 and 1563, which exerted a moralising action over the rites of Holy Week banning the “sacred theatre”, manifestations of devotion by the people consisting of representing the Holy texts as moving theatrical vignettes, the most popular being the Passion of Christ. 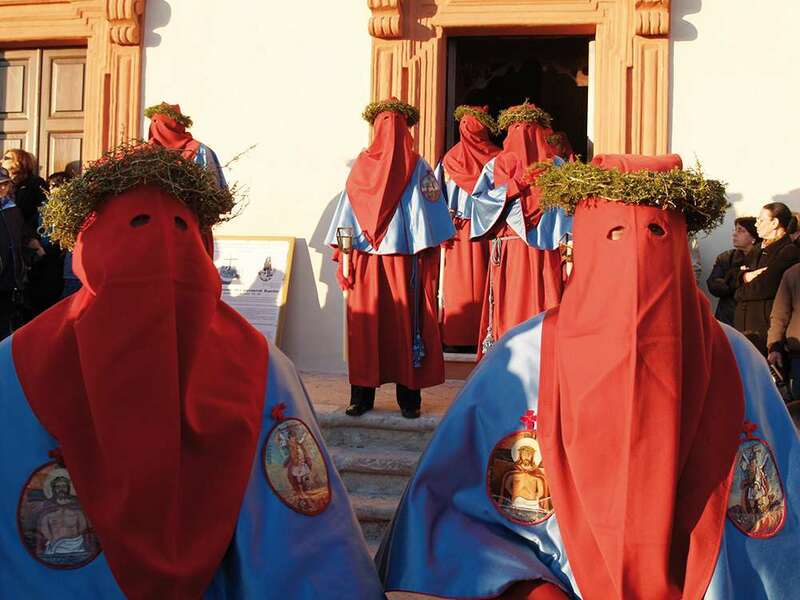 These performances were usually enacted in the church courtyards, and were also known as the “Mysteries”. 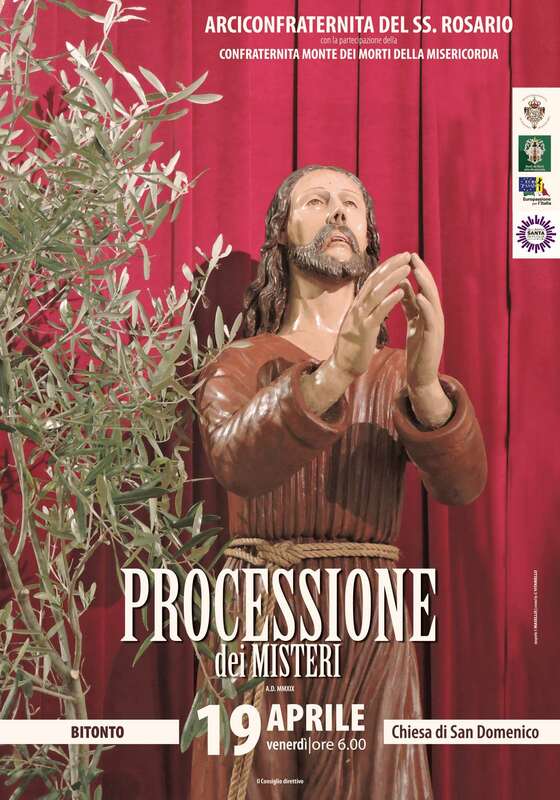 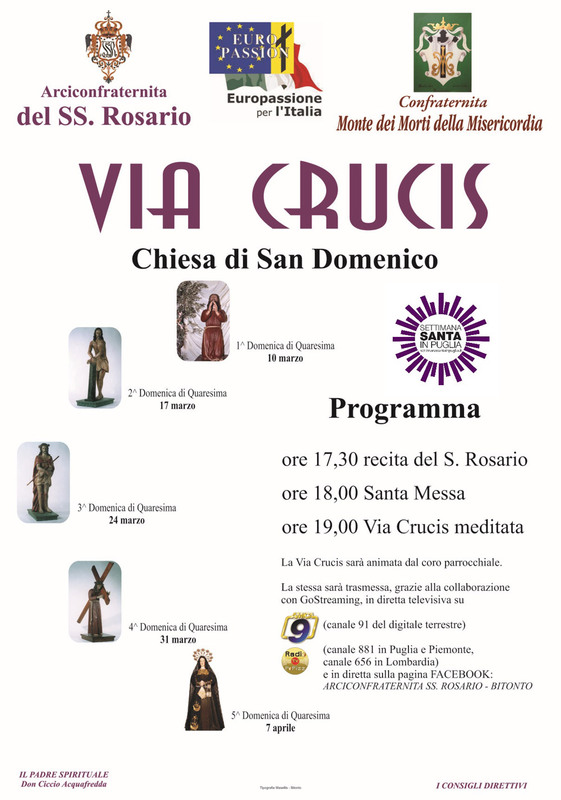 This form of “sacred theatre” was then substituted with processions organised by the Confraternities in which the “Mysteries” were there but not with live actors, these were substituted by statues portraying Christ, Our Lady of Sorrows and various characters from the Passion of Christ.This happened particularly in southern Italy and the leading role still played by the Confraternities of Apulia during Holy Week is simply a continuation of this. 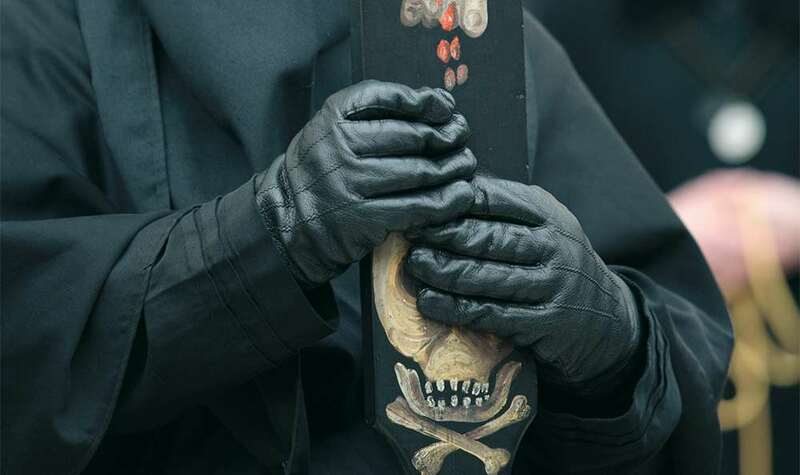 Many of these societies have specific characteristics deriving from their names or titles. 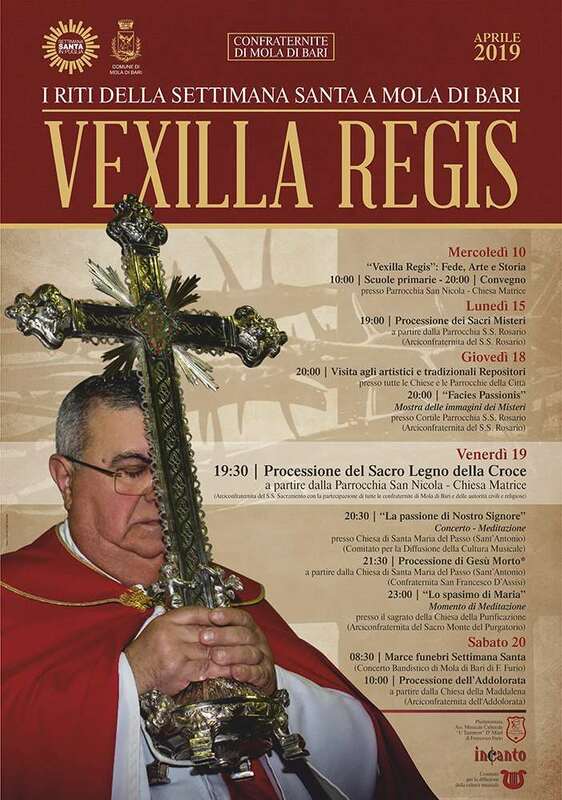 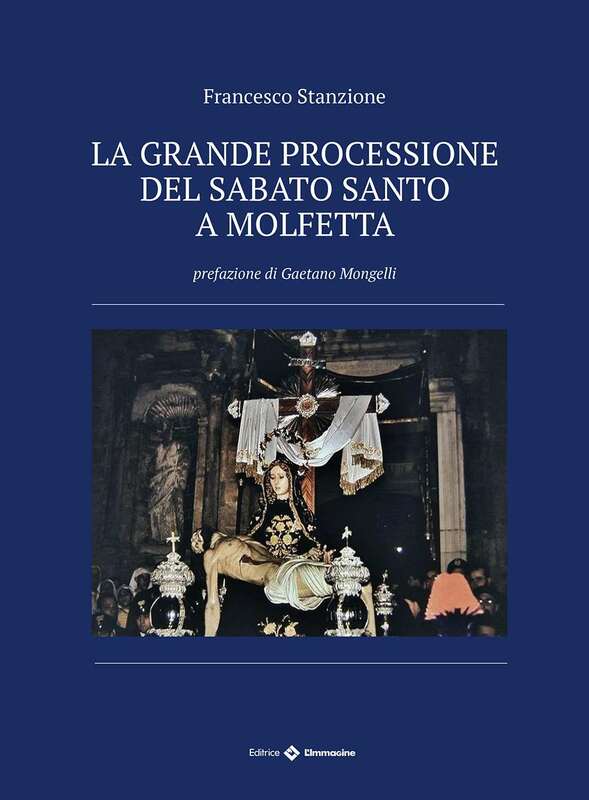 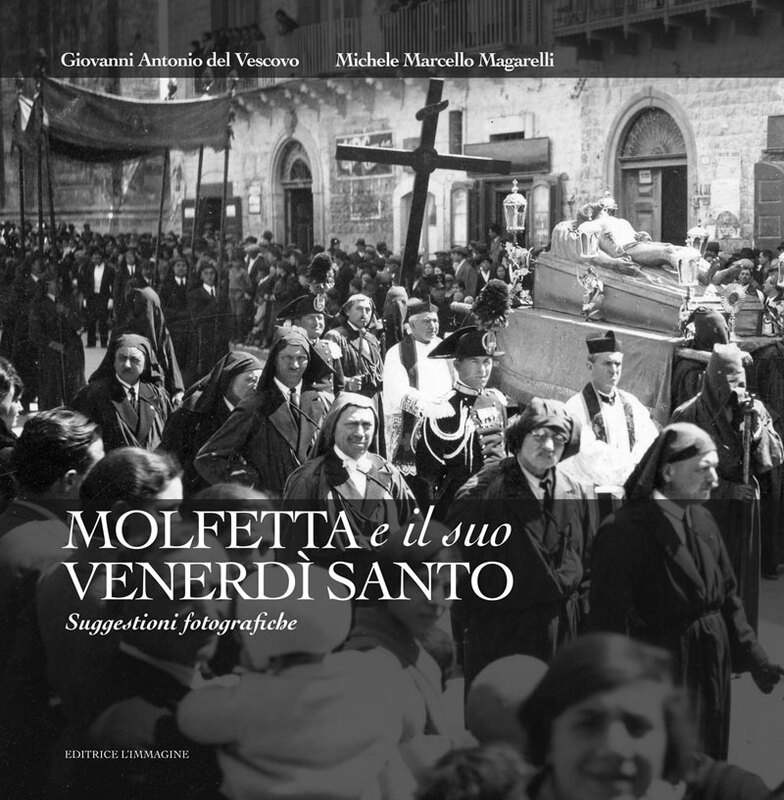 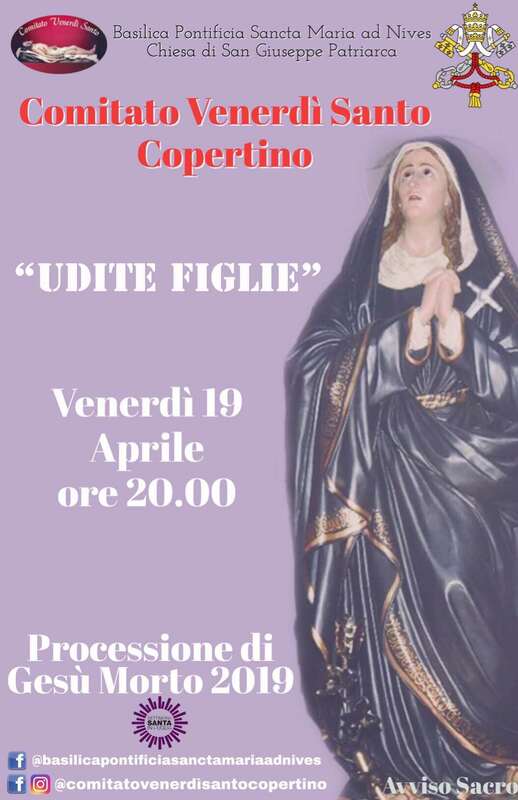 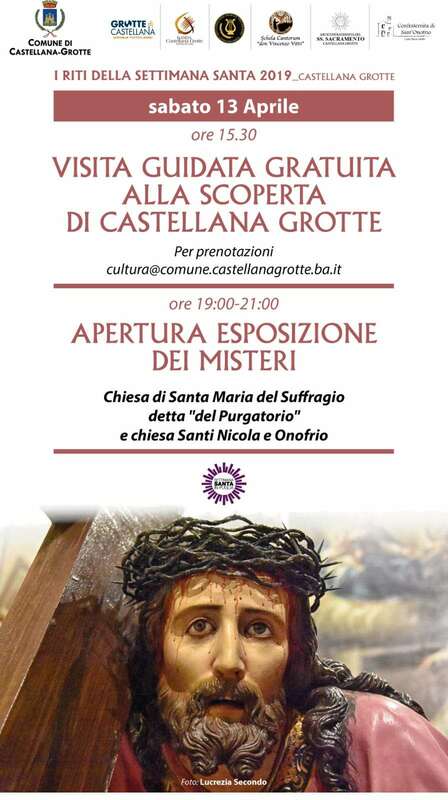 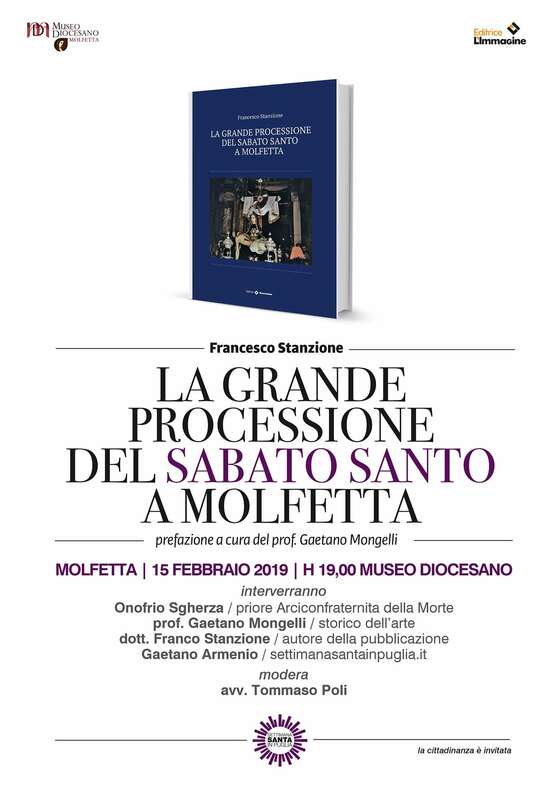 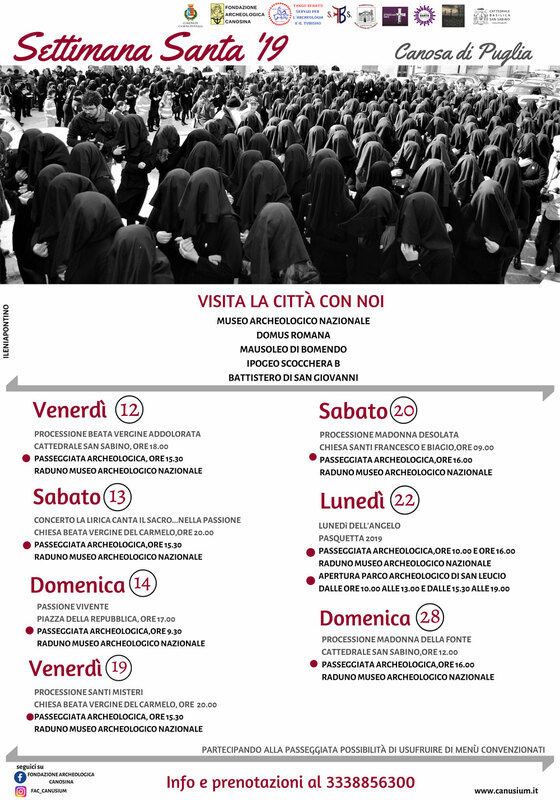 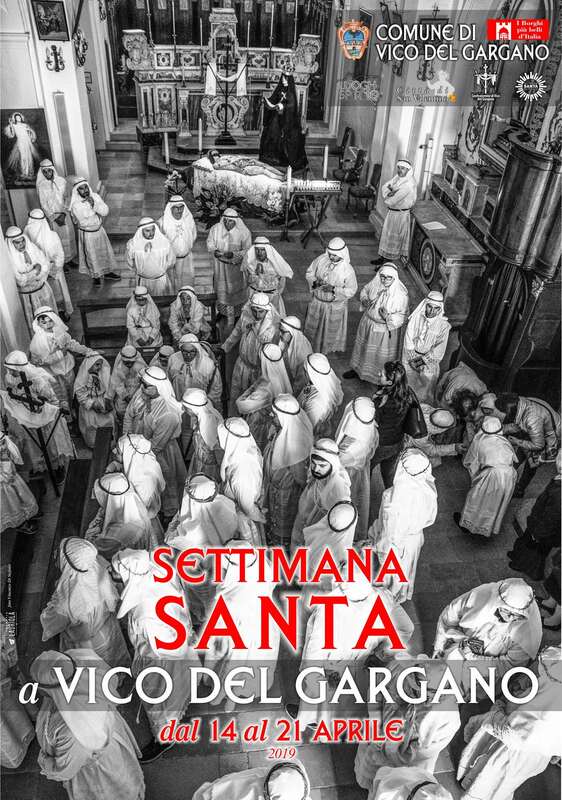 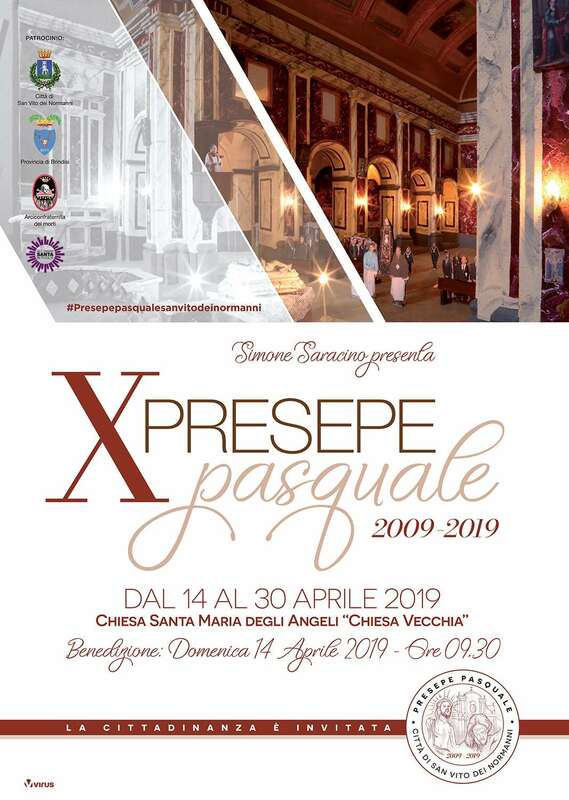 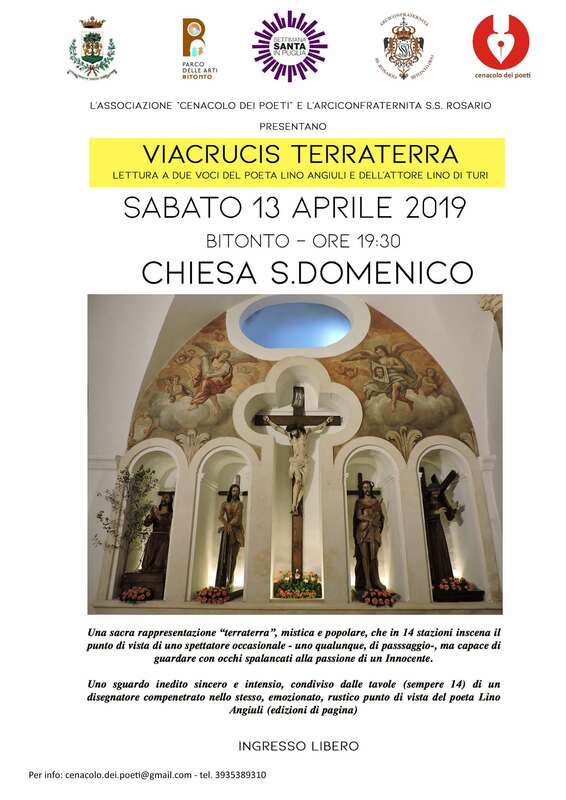 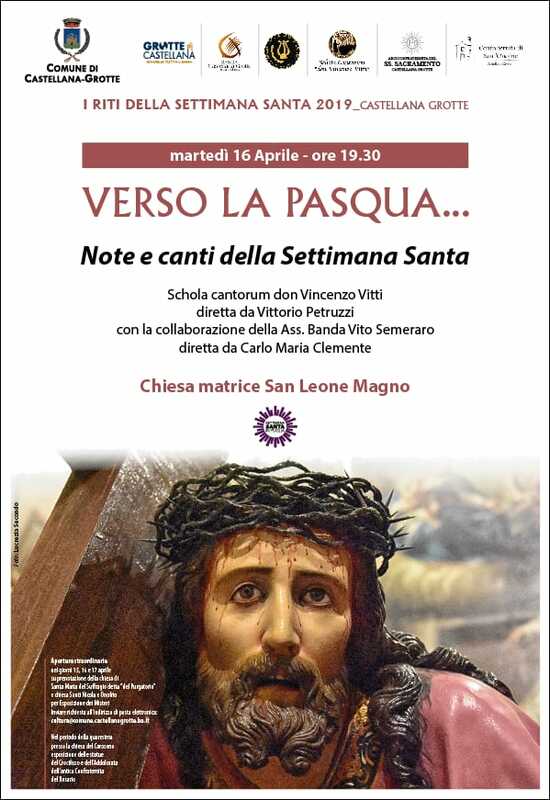 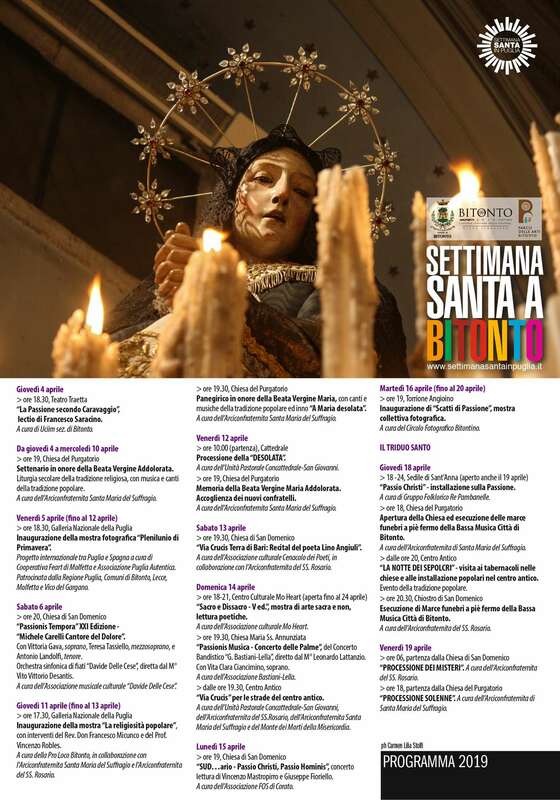 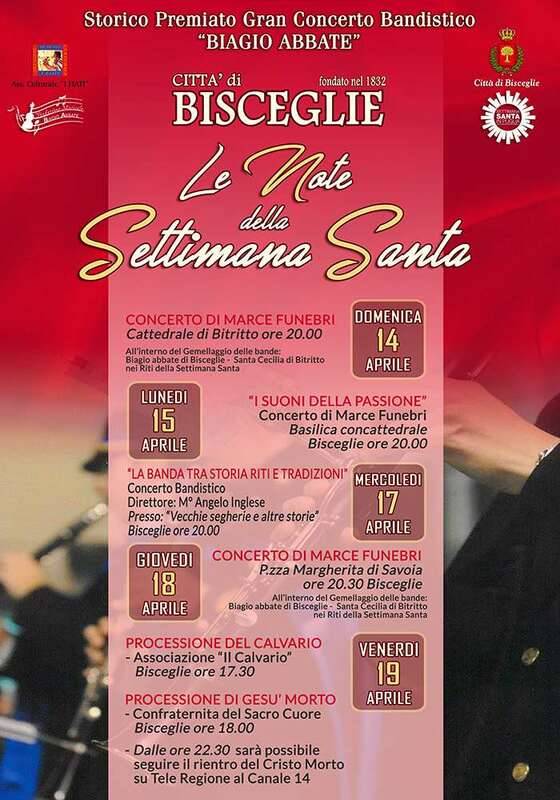 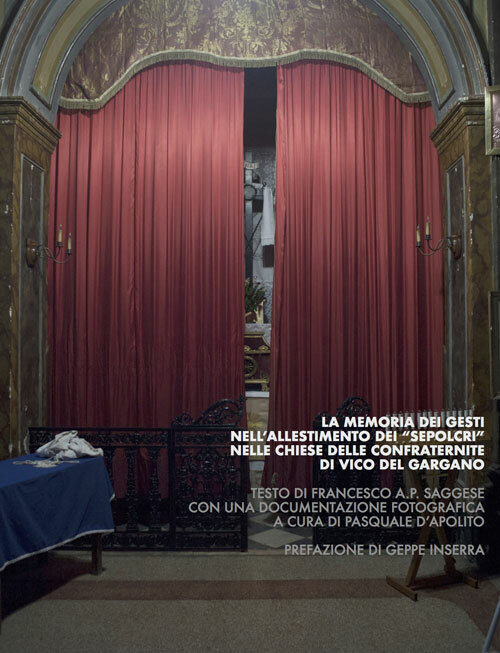 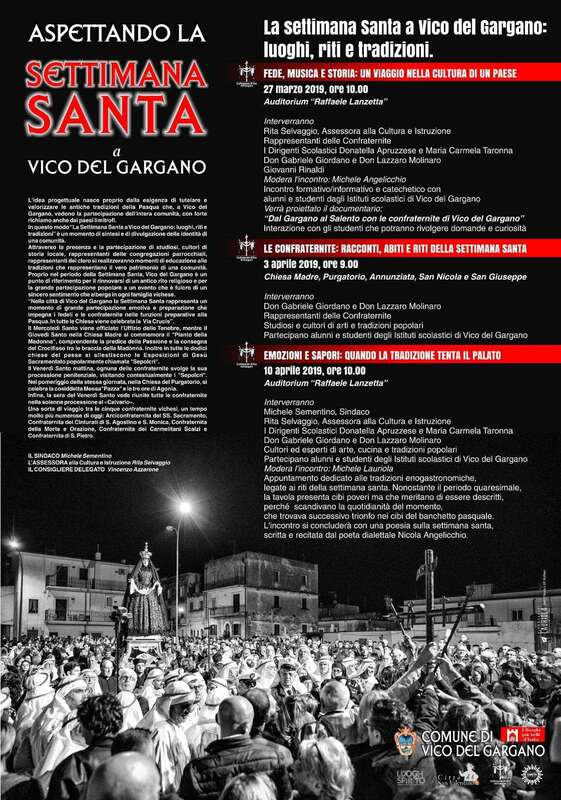 It is clear how the Confraternities with the title “della Morte” (of the Death) for example, are involved in organising processions for the days preceding Easter (in Cerignola, Molfetta, Oria, San Nicandro Garganico, San Severo), as are those denominated “del Suffragio” (suffrage- for example in Bitonto, and Ruvo di Puglia) or like the processions of the Mysteries in the province of Taranto which involve the Confraternities “Madonna del Carmine” (Our Lady of Mount Carmel). 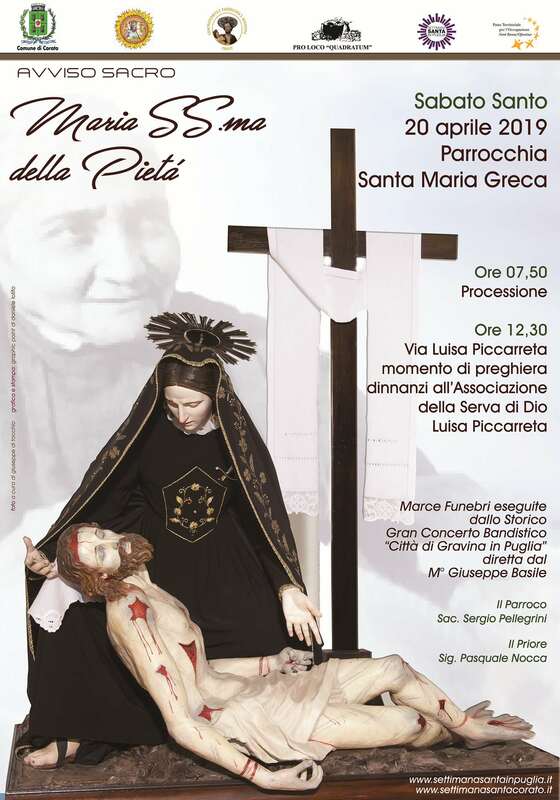 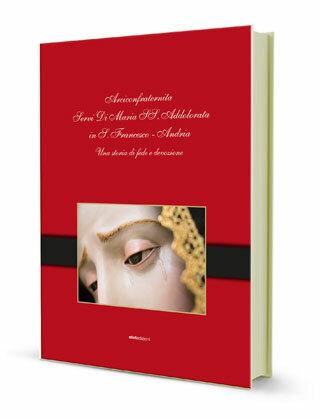 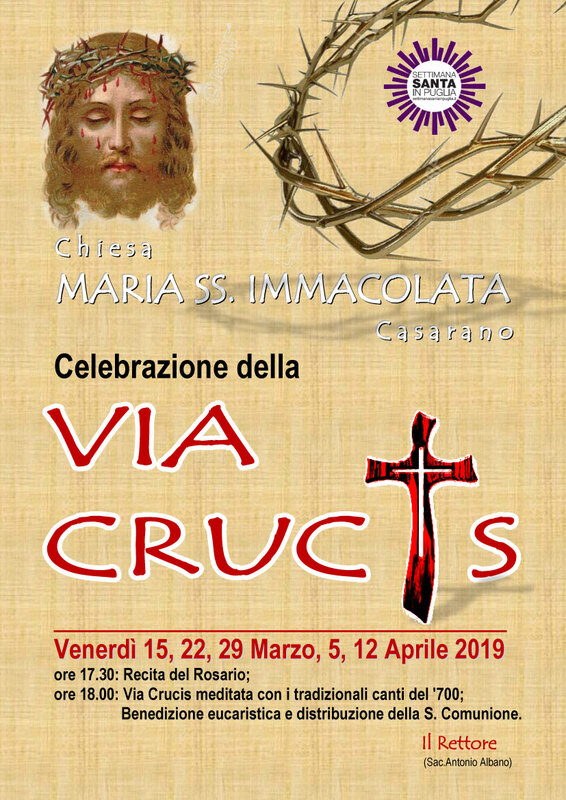 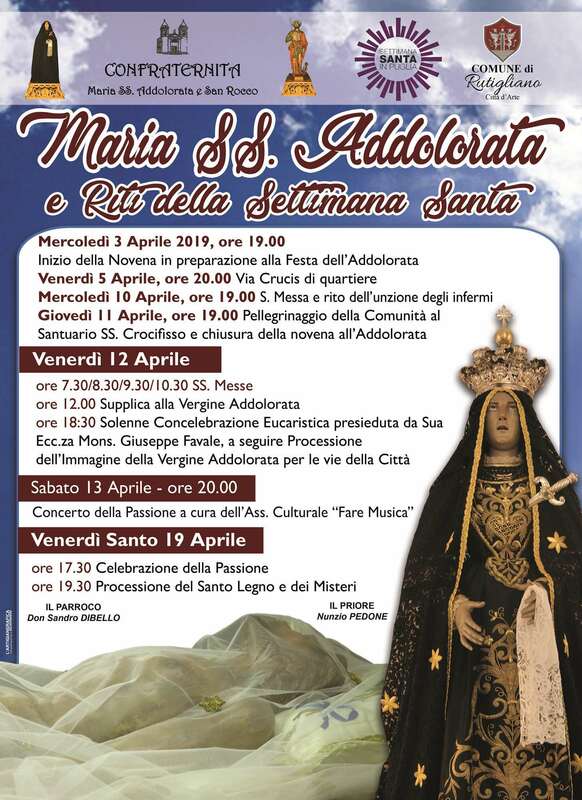 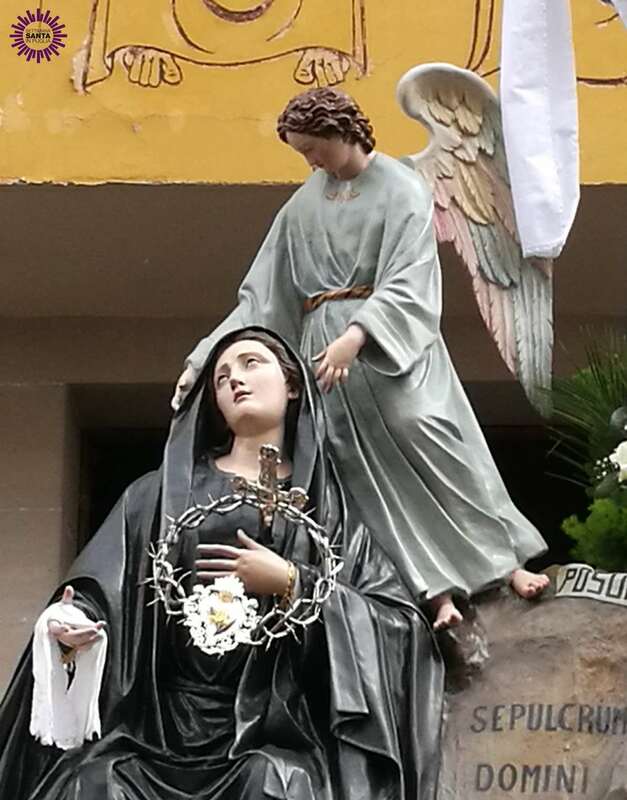 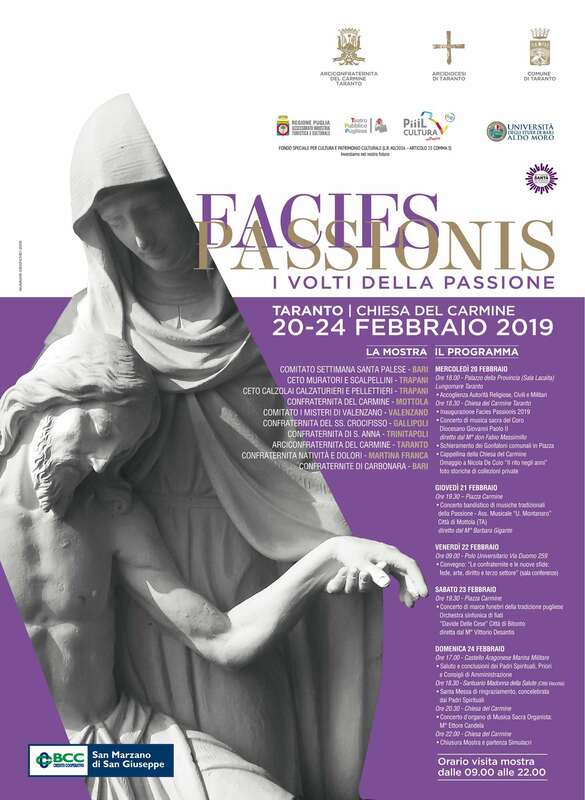 There are also many Confraternities dedicated to the “Madonna Addolorata” (Our Lady of Sorrows - in Andria, Bisceglie, Carbonara di Bari, Cerignola, Taranto, Trani, and Valenzano). 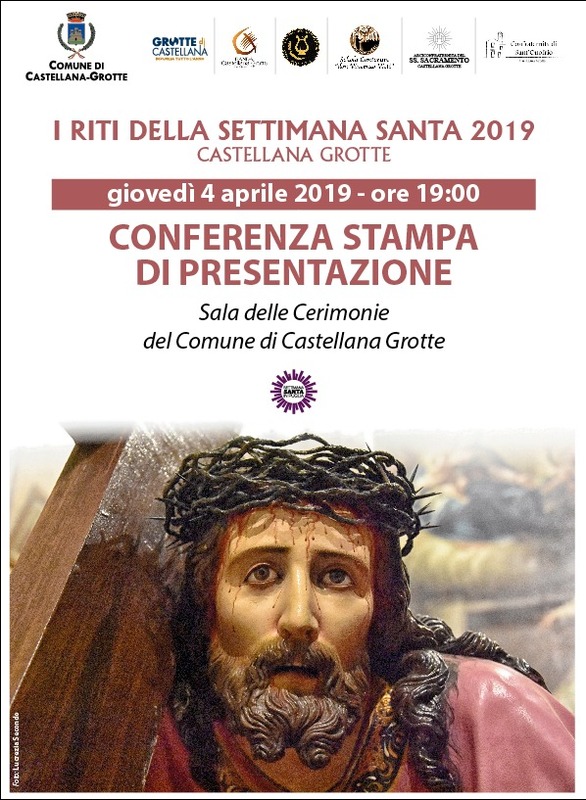 There are a number of objects that identify the Confraternities, even geographically: one is the “troccola”, typical of the societies in the province of Taranto, but little used for example in the province of Bari. 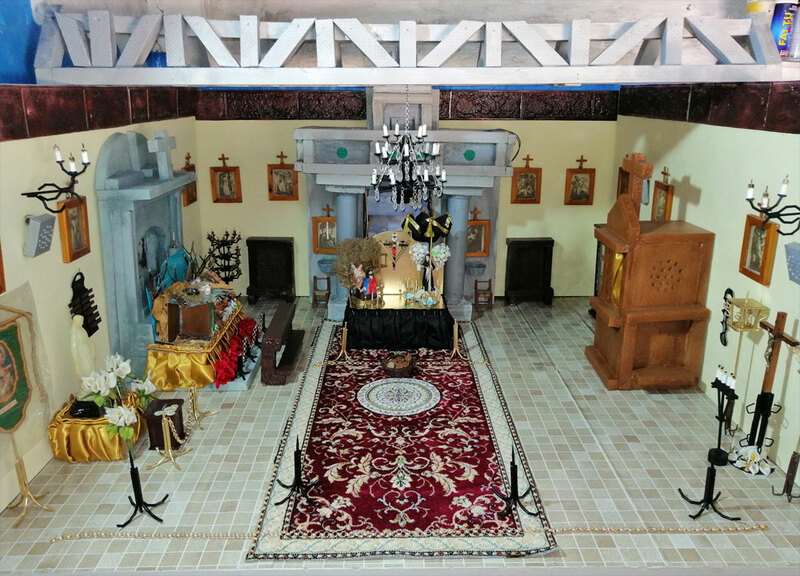 However it would be a mistake to think the Confraternities exist only for the preparation of these traditions of popular culture, which though important aesthetically are devoid of a wider Christian value; indeed, they are not made up of lay people simply committed to religious activities or defending local cultural traditions. 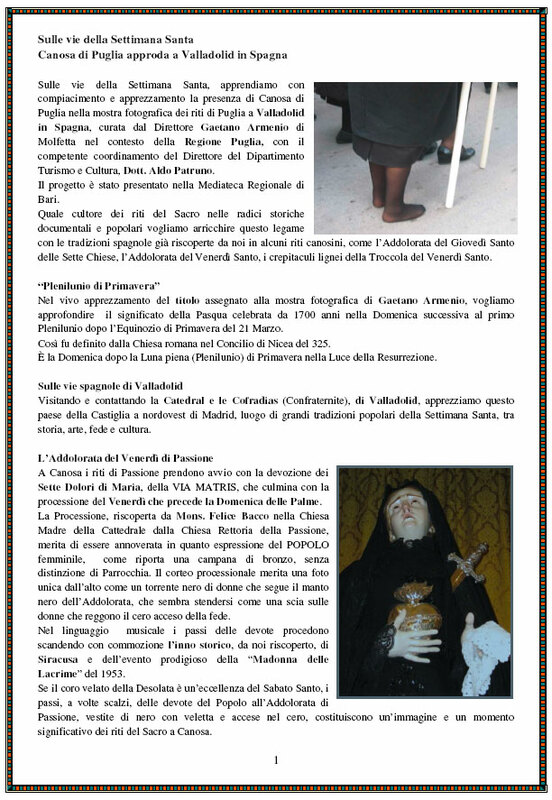 The rules of some of the Confraternities include charitable works such as is the case of the Archconfraternity of “S. 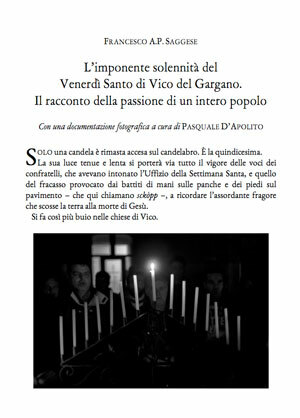 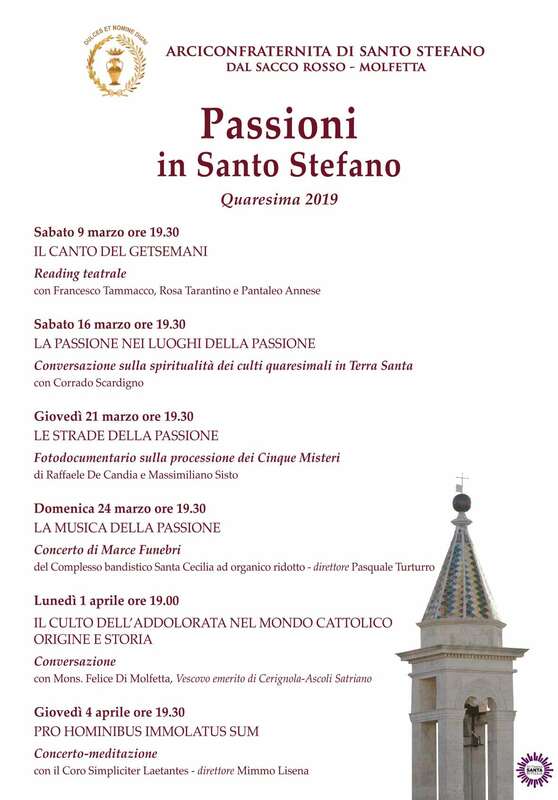 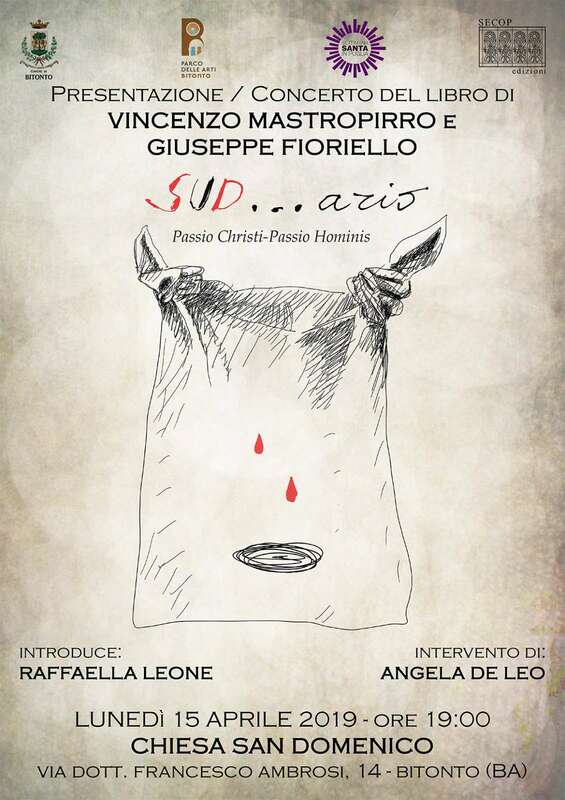 Stefano” which operates through the organisation called “Bontà di S. Stefano” giving assistance to people in need. 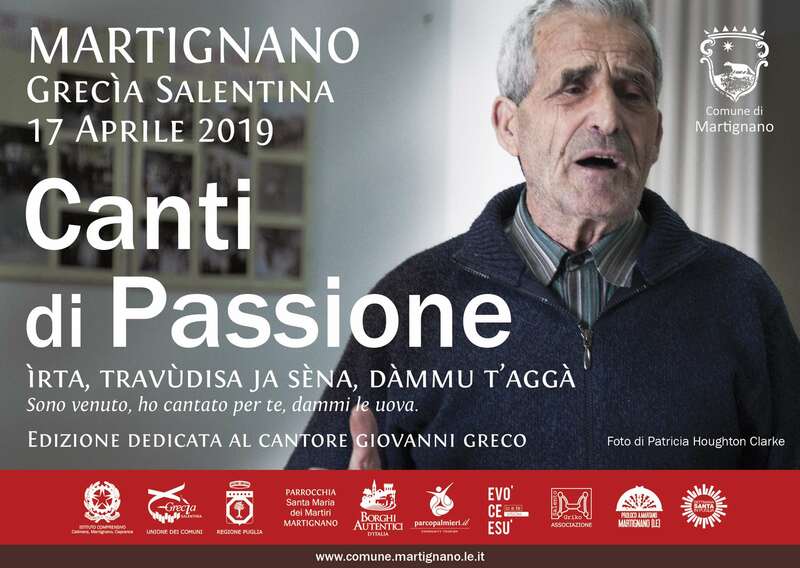 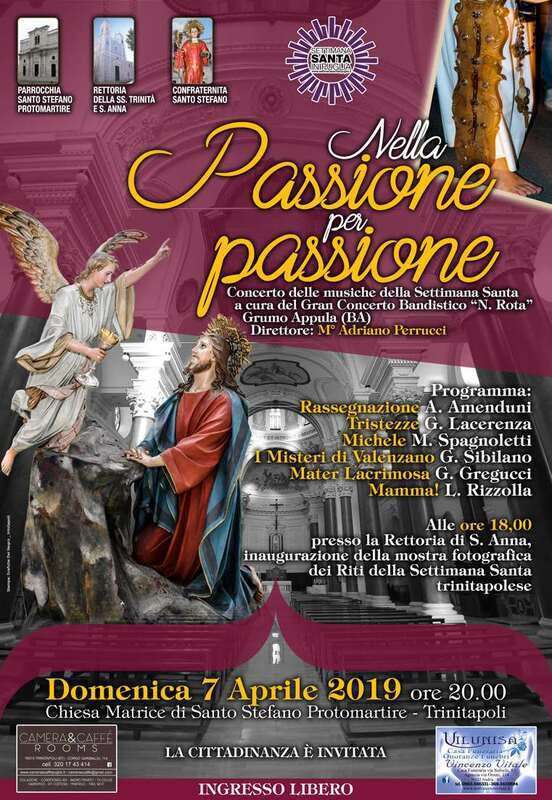 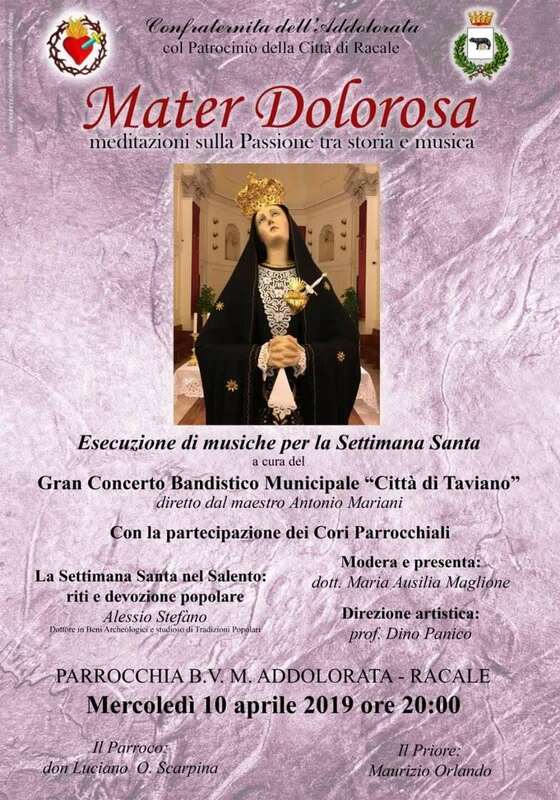 Others, in addition to assistance endeavours are also involved in philanthropic and human promotion activities like the Taranto based Confraternity “della Addolorata” with its “Cuore di Donna” award now in its 18th edition. 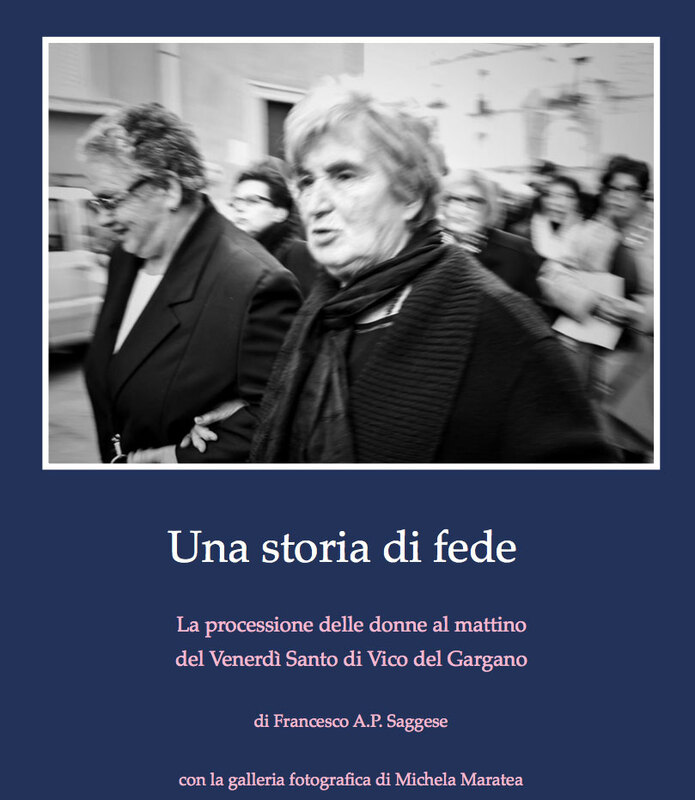 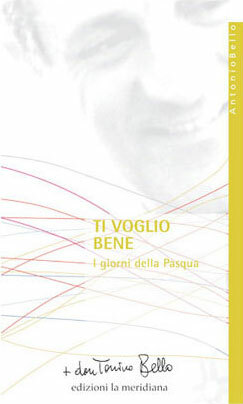 This is annually assigned to a woman from Taranto who has shown particular selflessness towards others. 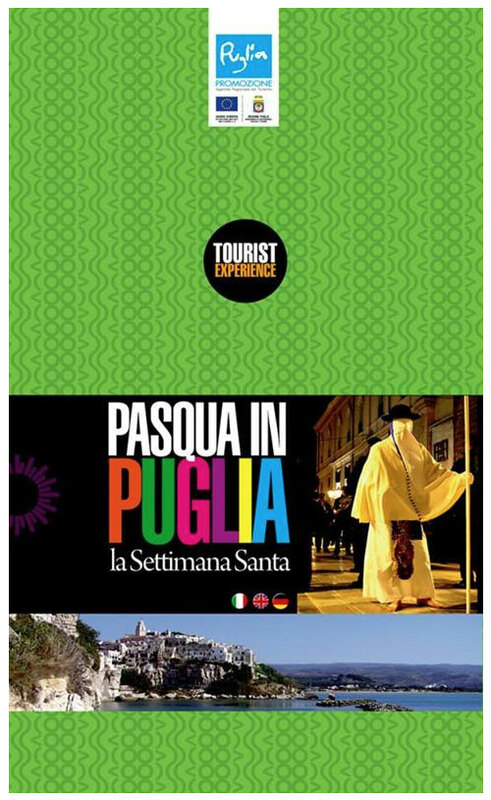 The Confraternities of Apulia, thanks to the great amount of work they have done over the years in the various dioceses are therefore also very active in the parishes and, depending on their economic possibilities, in providing support for the disadvantaged, as well as religious education for their members. 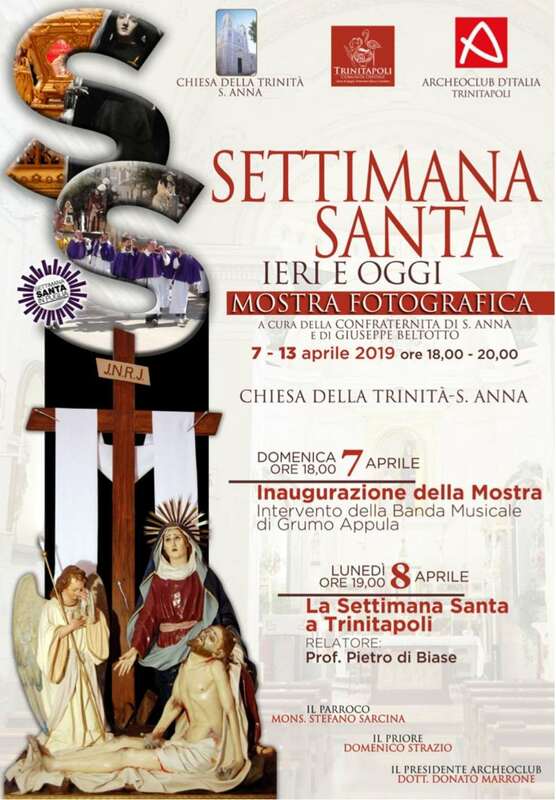 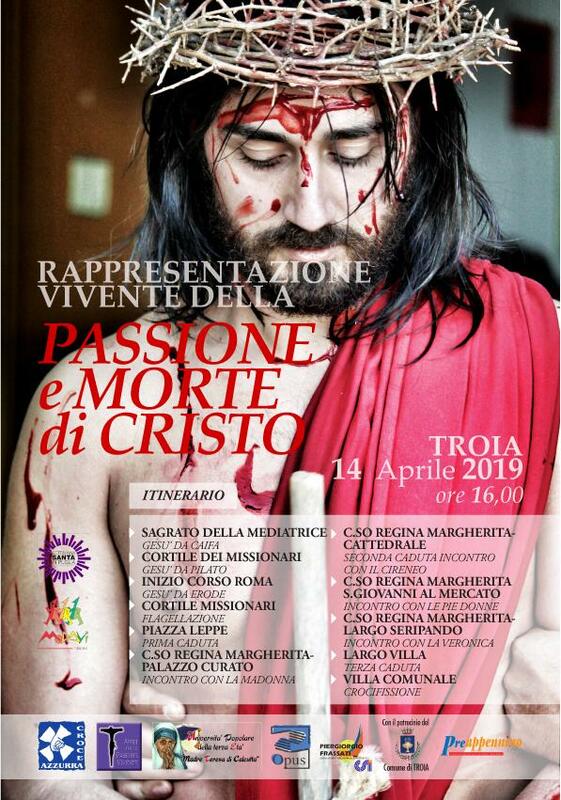 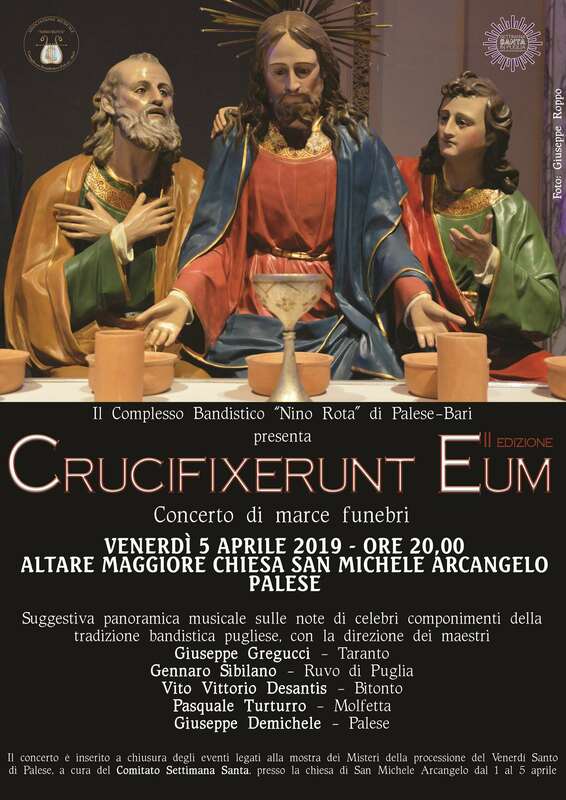 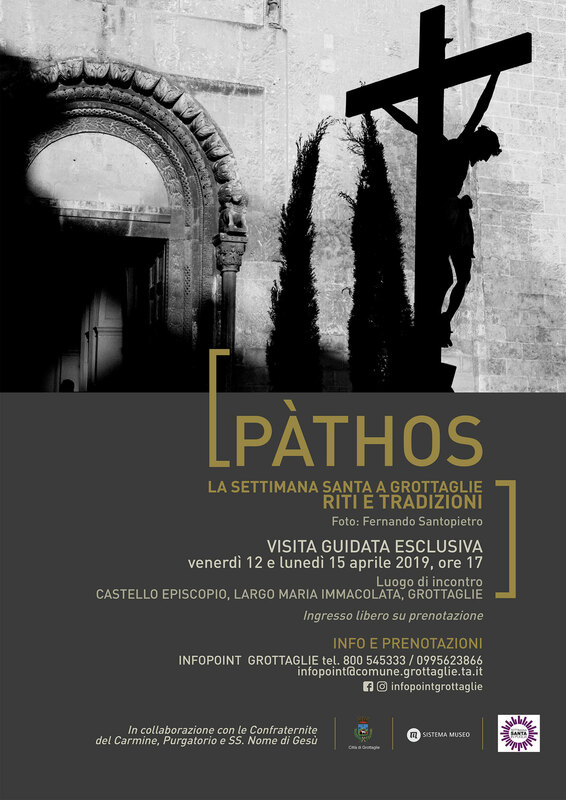 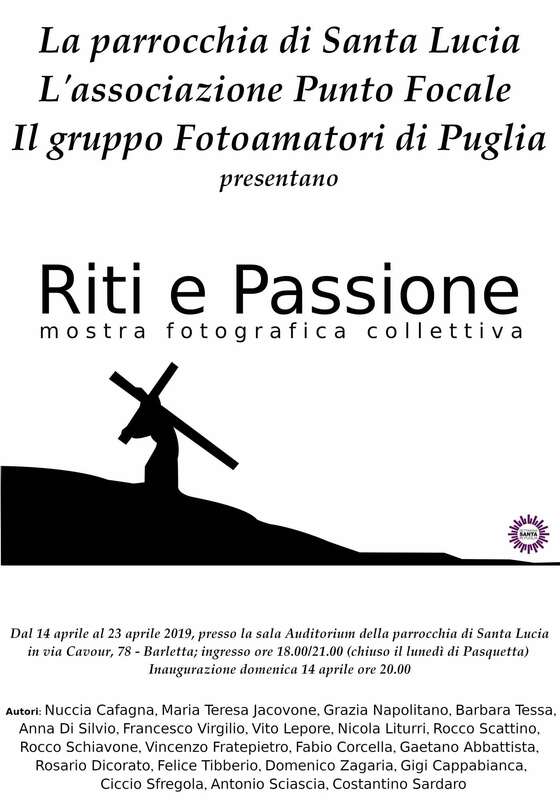 Because of this it is possible to say that Holy Week in Apulia is absolutely not about turning the Easter events into a show, but it is a natural and not artificial manifestation of the “pietas” of the common people, and therefore an authentic demonstration of faith, a guarantee of continuity over time and a means for spreading the message of the Gospel.